One of our newest brand marketing initiatives here at protocol 80 is podcasting, and although the idea of creating a podcast can seem intimidating to a novice, having started from scratch and gotten a podcast rolling I'd have to say it's much easier than most folks assume. There are plenty of free services available that make the process a lot easier, and if done right it can be pretty fun! As a result, I decided to throw together a quick set of tips for any small business looking for a new way to reach prospect clients. So first off, what the heck is it? 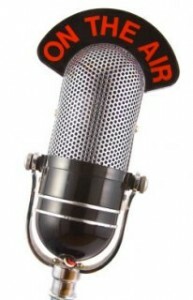 A podcast is simply a bit of recorded audio or video that is made available to people for subscription. Have you ever seen that little orange icon to the left that lets you subscribe to news feeds? 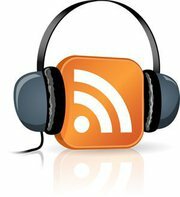 Podcasting uses the same technology (RSS) to make it possible for people to subscribe to an audio or video feed. When a new episode of a podcast is created it is automatically delivered to subscribers just as if it were a news story on your blog. One misleading part of podcasting is its name. Podcasts don't have to be played on iPods or Apple specific devices or hardware. People can listen in on their Windows computers, third-party MP3 players, phones and just about any other device capable of playing audio files! You also don't have to be listed on iTunes to have a podcast, though it does help to attract new listeners and gain feedback about your podcast's content or quality. You need a topic that you're passionate about. If you're talking about a topic that's boring to you, there's a good chance that you'll dread sitting down to record on a weekly or daily basis. Hopefully you've already begun a blog for your small business - in that case you have your topic chosen already! Just discuss the same sort of subject matter as you write about. Podcasting is a great way to show that you're a thought leader in your business's industry. Secondly, and this is probably the most-important element you need to bring to the table, you need commitment. It's just like blogging - the more often you write (or in podcasting's case, record) the more effective it is). Having a topic in mind that you WANT to talk about goes a long way in getting there, but it's also helpful to setup a schedule as to what time you record. Block some time off every week and be sure to show up on-time. Admittedly, the protocol 80 over coffee podcast has hit some bumps in this road, but as I stated we're new to this too! This is fairly obvious. You'll need a microphone attached to some sort of device that's capable of recording audio. 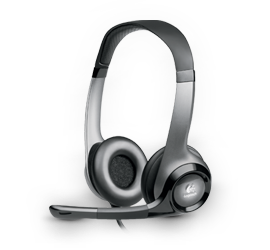 The easiest way to start off is to use a USB headset or your computer's built-in microphone if it has one. If the podcast starts to take off and you're noticing a return on your time spent then by all means step up to a higher-quality mic, but when you're new to the game just use whatever you have available. There are a lot of free programs available for both Mac and PC that make recording and editing your podcast very easy. On the Mac I'd recommend starting out with GarageBand, a free audio program that comes installed on all apple computers dating back to 2004. On the Windows side of things I'd recommend starting out with a free program called Audacity. Both are very easy to use and made with the beginner in mind. Simply record your audio and then select bits you want to cut out or add your theme music and you're done. Probably the most involved part of creating your podcast is finding somewhere to host it. The good news here is that there are some free services that'll get you started. Right now we're using a website called Podomatic that has free hosting up to a limit. The cool thing about Podomatic is that they'll automatically create a feed for your podcast so that it can be submitted to iTunes, and they even provide some basic analytics so you can track how many listeners you're reaching out to. Another example service that offers free hosting is PodBean, though I haven't had experience with them specifically I'm sure they offer many of the same features. Take a look at both and see what works for your needs (or do a google search for 'free podcast hosting,' there are plenty of services available)! Like I said above, we're new to podcasting too, but from listening to other podcasts and working on our own I've come up with some helpful hints that might make the process a bit easier. I cannot stress how important this is. Try to block off an hour every week to sit down and record your podcast. If you stick to the schedule it'll become second-nature before you know it! If you have listened to more than one episode of our podcast you'll know that we follow the same format every episode. First we discuss the news posts each of us posted to the blog for that week, then we have a quick break for promotion (more on that shortly) and then finally we wrap things up with some rapid-fire news headlines that caught our respective eyes from that week. The reason we went that way is that we can do a little bit of self-promotion, like telling folks where they can follow us throughout the week and in-between podcasts, but give the listener a reason to stick around after that promotion. This is also known as a "tease." Another good idea is to think about how long you'd like each episode to be. Will your podcast be relatively short, say 15 to 20 minutes, or will it be closer to an hour? When you think about your format or content for a specific episode keep that length in mind - you don't always have to hit it on the dot but it's a good idea to give the listener a consistent experience. You don't necessarily have to follow the same format we use but it's good to have one cohesive guideline by which mosts of your episodes adhere. As I mentioned above, it's always a good idea to expose the listener to some opportunities from which they can follow up and learn more about your company, product or service. You don't have to be long-winded about it, but make sure you tell them the name of your business and say the address to your website, blog or social networking services if at all possible. It's also a great idea to ask listeners to use these means of communication to provide feedback on the show, such as what they'd like to hear you speak about in future episodes! Remember - this isn't a conference or sales call! People are tuning in not just to learn a bit about your subject but also to be entertained to a certain degree. Try a casual approach to recording, whether that means joking around or discuss simple topics like the weather and your interests outside of your primary topic. This helps the listener get to know a little more about you and create a connection that will bring them back for follow-up listens. Most importantly, it helps you to have fun while you're recording, and hopefully you'll look forward to your designated podcasting time everytime you sit down to record an episode. So those are my quick tips for starting your very own podcast. It's very cheap (if not completely free) to get started and yet another great way to connect with current and prospect customers. If you're considering starting a podcast or if you have one already please let us know all about it in the comments below!